Sailing through waters with nothing but expanse of blue oceans all around you can be pretty tricky sometimes. Even in smaller waterways, the navigation problems and situations are over grave enough to cause serious trouble even with minor overlooking. There is barely a room for a mistake and that is why navigational aids are as important as they are to the marine world. Typically aid navigation is an external structure designed to help a ship or any other marine craftto make way through water. This is essentially a structure outside the ship which helps the ship in safe journey. The purpose of typical aid navigation is everything from guiding a ship in the right direction to warning about an imminent danger. It can also be used by a vessel to point out its exact position in the water or to warn other ships about its location in case it is stuck in some situation such as failed propellers, grounding, engine failure etc. The oldest form of marine navigation mainly relied on aids like the constellations which were always constant and helped the sailors to find out the general direction by reading the position of sun and stars and analyzing the results to estimate coordinates of their location. Lighthouses were next that helped ships greatly. These structures, which indicated presence of land to a ship so that the mariners could estimate the distance from land and plan their anchoring etc. proved quite helpful to the sailors in the earlier days of shipping. The lighthouses, as the name suggests, flash light constantly especially during night which can be easily noticed by ships in distance. Over the time, lots of other navigational aids have come up, each just as important as the other. The most important purpose served by such a navigation aid is to enhance safety of ship by a great amount. When used properly, these navigational aids can be instrumental in preventing accidents of large scale. However, with changing times, the need of marine navigation changed as well. While earlier the sole purpose of a ship was to successfully complete a journey without being lost, hence the aids used then were more focused towards helping with just that. But today, it is also about speed, efficiency, economic output, carrying capacity and lots of other things. As such, the aids to navigation or ATON, as they are also called, were upgraded accordingly to meet these needs. ATON help the sailors today with the special navigational needs they have which can include maintaining an unobstructed sailing to doing so at a desired speed. 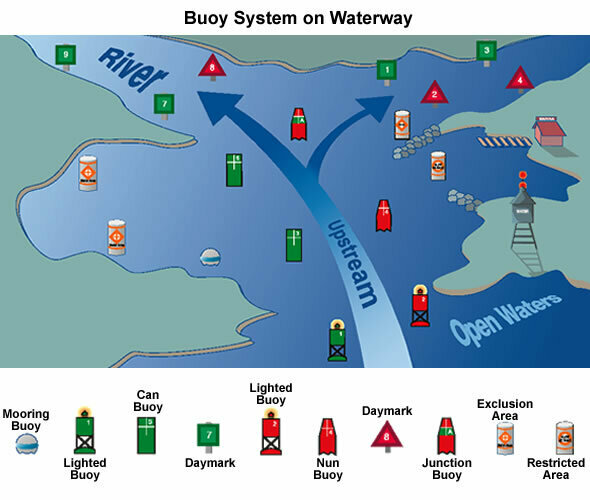 A navaid, today, can include structures like lighthouses, beacons, and buoys. These structures when combined with special patterns like color codes, lighting patterns or positioning can indicate special meanings which can be understood by other ships easily. This helps in easy relaying of important messages like a ship being in danger or locating a particular ship or warning another ship with a message like ‘I am stuck in the water, go slow’ or ‘trying to start the propellers, keep caution’. These things can avoid major accidents. International regulations strive to set standards for a navaid like buoys (color, lighting, positioning) which can be understood by sailors all over the world to prevent any confusions and save lots of lives. So while it may look like navigational aids help a ship in finding the general direction, their main purpose is to aid navigation so that every ship can complete every voyage she starts safely.